Want evidence that you should par-take in a mobile campaign? Here are 8 examples varying in industries presented by Econsultancy. Mobile marketing is still a developing industry and one that does suffer something of an image problem. Taken purely in terms of click-throughs and conversions mobile ads don’t always deliver the best returns, so it’s up to the mobile networks to continue improving ad units while also convincing marketers that it’s not all about clicks. To assist in this endeavour, I’ve rounded up eight case studies of mobile marketing campaigns that proved to be a success. For more in-depth case studies, head over to our Case Study Database which is available to Econsultancy subscribers. And for more on this topic download the Econsultancy Mobile Marketing and Commerce Report or read my post looking at eight great examples of mobile marketing from Southeast Asia. 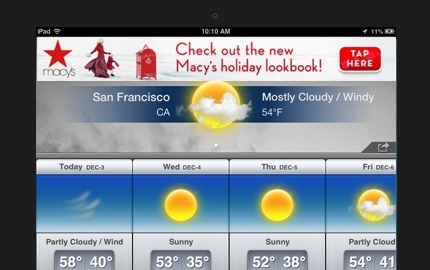 Macy’s used rich media mobile ads to promote brand awareness and purchase intent for its upcoming Winter Collection. The multi-panel rich media ads were targeted at female iPad users aged 25-54, and allowed consumers to view a branded video, browse a product catalogue and access a store locator without leaving the ad unit. There were also calls-to-action encouraging users to follow Macy’s on Facebook and Twitter. As a result of the campaign purchase intent apparently increased by 134%. To promote the benefits of its ‘black box’ telematics technology that rewards careful drivers with lower insurance premiums, the Co-operative created a smartphone app that allows people to test out the system before they buy one. The target demographic was drivers aged 18-24, so the Co-op used mobile ads to raise awareness and drive app downloads. Working with Mediacom, it decided on a multi-faceted approach involving placements on mobile ad exchanges, Facebook mobile app install ads, and MMS ads targeted at people identified as car enthusiasts. In the first week, the app was downloaded more than 1,100 times, exceeding the target (100 per week) by over 1,000%. Within the first four weeks of activity it was downloaded more than 3,500 times. The original target cost per download (CPD) was set at £31.88 and in the first four weeks a CPD of £0.91 was achieved. This is one of the more bizarre mobile campaigns I’ve seen, but it did achieve decent results for Gillette. It involved rich media mobile ads that prompted users to ‘begin a race’. 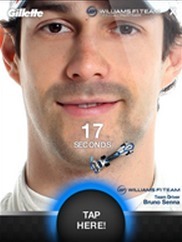 This launched an interactive game that required people to shave F1 driver Bruno Senna using a car shaped as a razor. Users could then purchase a razor from within the ad unit or share the game via social media. The ads were targeted at males with a mid to high disposable income and achieved a CTR more than twice industry standards. More than 20% of users who engaged with the ad once ended up replaying the game. However we don’t know what impact it had on brand awareness. Remember the swine flu panic? Turned out to be a whole lot of fuss about nothing, but it did at least yield a useful mobile ad case study. Boots used a variety of mobile tactics to give people access to relevant information about the virus and also encourage them to use a search tool to find their local Boots pharmacy. It developed a simple guide on its mobile site containing information about swine flu symptoms and how to prevent its spread, then drove traffic to the site using targeted mobile ads across Vodafone Live!, O2 Active and m.RTE.ie. There are no specific stats on the campaign’s success unfortunately, though it’s claimed that the ads were ‘very effective’ at driving click-throughs to the site. Boots also promoted the site via SMS, enabling consumers to respond and receive location-specific information on pharmacy locations. 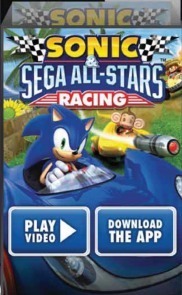 To celebrate Sonic The Hedgehog’s 20th birthday, Sega released a new iOS game called Sonic & Sega All-Stars Racing. In order to reach the target audience of gamers aged 14-34 inMobi ran rich media display ads on iOS devices in North America. The ads linked users to a dynamic landing page featuring the game trailer and a CTA encouraging people to install the game. CTR peaked at 0.9% and the game reached the number one spot in the App Store, but there’s no word on how many downloads were driven directly by the mobile ads. The North Face used its first ever mobile ad campaign to raise brand awareness among males aged 18-34 in Germany and Italy. Working with Millennial Media it used a full-screen interactive video placed in apps that indexed highly among the target audience. The goal of the campaign was to achieve completed views, but users were given the option to skip the video after 7.5 seconds. On completion of the video, four buttons offered a more comprehensive experience, with the option to click through to local market websites or the global Facebook page. There was also an option to replay the video. The campaign achieved more than 319,000 completed views in Germany and 114,000 in Italy. This led to engagement rate with local North Face sites of 9.5% in Germany and 8.5% in Italy. The video itself also proved to be popular, as a third (33%) of German viewers replayed it for a second time, as did 19% of those in Italy. To promote the launch of the Windows Phone Nokia Lumia 1020 in Germany, Microsoft created an interactive ad that allowed people to test out the phone’s camera function. It targeted 18-35 year olds with interests in technology and design by selecting specific publishers across sports, tech, gaming, entertainment, fashion, design, and other creative industries. The campaign was also targeted at people using competitor devices. After clicking on the banner ad a photo was displayed on a Nokia Lumia that consumers were able to interact with to experience its high-resolution zoom. Users could then click through to a mobile optimised landing page and get more information on the product. The ads achieved an engagement rate of 3.23% and 8.63% of people who engaged with the ad clicked through to the site. London’s Capital FM radio station set out to boost downloads of its iPhone app as part of a plan to increase listenership while also helping to better define its cost per customer acquisition. It used geotargeting to access more than 1m iOS users in the UK on the AdMob ad network. A secondary goal was to achieve a high ranking in the App Store, so on the final day it massively increased ad spend while also optimising the ad placements using real-time analytics. Capital FM’s app ranking in the UK App Store rose from number 10 to number five in the music category. It achieved a CTR of 1.35% on average during the four-week campaign. More than 24,000 users visited Capital’s app download page in the App Store. This entry was posted in Mobile Marketing, Smartphones, Strategic Marketing, Technology. Bookmark the permalink.